One of the downsides to being the minster in a small town is everyone knows where you live. So when life hits the fan and you need your pastor and no one answers at the church, you just go to his house. You got it. Be it domestic dispute, full mental breakdown, someone dies, someone needs money, someone who is drunk or on drugs. They would ring the doorbell and you never knew what was on the other side. We would try to tell whomever was at the door that Dad was out. But regardless of what we would say, they wanted something. They would offer to wait. They weren’t going anywhere without something, anything. They knew they were at a place that offered hope, offered what they sought. They knew they were close. So we told Dad in no uncertain terms that we needed something. We needed something to give them so they knew we would share their needs with Dad. 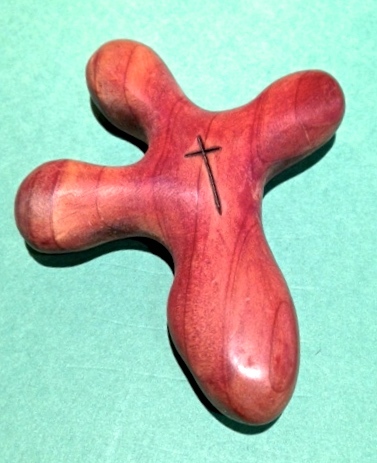 My Dad reached out to a woodworker in the church and they came up with a brilliant solution. Emergency crosses. I still have a jar of them today. I keep one in my car – although I painted my baby doll pink. I have my emergency cross at the ready for whenever I need it! The design was simple. Made of wood it was 3 inches tall by 2 inches wide. We kept the crosses in a jar by the front door. We would offer them to whomever showed up and needed one. We would say a brief prayer, take their information and then they would go on their way. Of course if they were stoned, drunk or under a substance we had them sit in the front hallway till they came around. Which reminds me of this story. We used those emergency crosses everywhere. I took them with me to hospital calls, Dad took them on pastoral calls. He always had a huge stock of them. He even kept them in his car. Even in retirement when he would walk the beaches to minister to the homeless, lost and broken, he had a stash of crosses. When I went to the funeral home for the viewing of my Dad. I ran out to his car and pulled out one of his emergency crosses. While in my heart I knew it was too late. That he was with His maker and he didn’t necessarily need his emergency cross. I still wanted to make sure he had one. My husband gave the cross to the funeral director to ensure he had one. Yep right up to the end – Dad’s emergency crosses always saved the day. Poverty, brokenness, humanity always came to our front door. I struggle to tell people why I am different than others. Where do I begin to share all I have seen and witnessed from my front porch? How do I share what I have seen? How do I share that each of us carries burdens, each of us is broken? How do I share that each of us is part of something bigger than ourselves. That each of us needs relationships with others. Where do I begin? I’ll tell you this much, I have my emergency cross in my car. I never leave home without because I need them just as much today as I did when I was a kid.